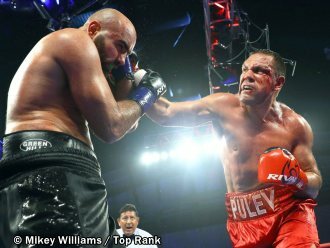 COSTA MESA (March 23, 2019)— Kubrat Pulev wanted to send a resounding message to the big names of the heavyweight division, and he did so by scoring an emphatic knockout victory in front of a sold-out crowd at The Hangar. "This is just part of being in a fight. The cut was not such a big problem. Sometimes blood makes me very hungry", said Pulev. "I was very well prepared. I was ready for anything. At this moment I feel I can do anything inside the ring. I showed very good boxing skills. I also showed that I have good punching power and a good strategy". 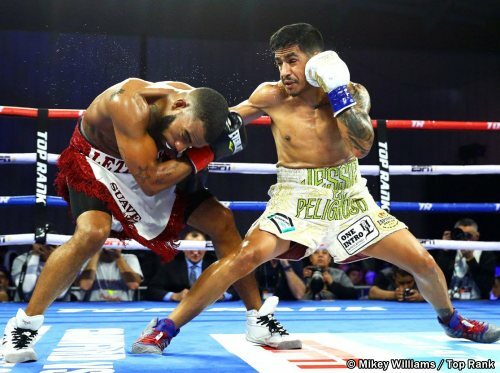 In his featherweight debut, former world champion Jessie Magdaleno returned to the winning route by scoring a unanimous decision victory over former world titleholder Rico Ramos to capture the WBC USNBC Featherweight title. This was Magdaleno's first fight since losing his WBO super bantamweight world title in April of 2018 against Isaac Dogboe. "I came back from a long layoff and felt great against a tough opponent and a former world champion", said Magdaleno. "Ramos is a great fighter, he was a former world champion for a reason, but tonight only one of us could come out victorious, and that was me. Now I'm going to sit down with my team, go back to the drawing board, and see what I have to keep working on to become a world champion once again".